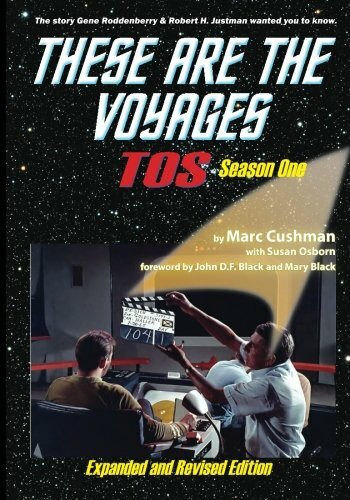 Recently I wrote a review for Visionary Trek of These are the Voyages Season Two by Marc Cushman. This is the second part of a three part series that explores Star Trek : The Original Series using documents given to Marc by Gene Roddenberry. After my review was put up on the Visionary Trek website the publishers of the book; Jacobs Brown Press also put my review up on the These are The Voyages website. Over the years I have read quite a few books that have claimed to have had the “inside” story or have a “complete” account of Star Trek: The Original Series (TOS). Each time I read one of these books I would often find myself reading things that I already knew, whether it was about the episodes or about the cast and crew or even Gene Roddenberry himself. Last year I discovered These are the Voyages Season One written by Marc Cushman, this was a book that would change my whole outlook on The Original Series. As a Star Trek fan for over thirty years I thought I knew pretty much everything about TOS but this book would soon show me I hardly knew anything. Before I talk about These are the Voyages Season Two let me give you some background information about how the series came to be, the format of the books and about Season One. Marc Cushman met Gene Roddenberry back in 1982 while working on a proposed TV documentary about Star Trek. Gene gave Marc access to thousands of production documents about the series and when the documentary did not happen; Gene suggested that Marc turn his research into a book. Over the years Marc would interview those who worked both on and off screen about the series and then in 2007 he began to write the book. Some six years later Marc found he had a story totaling over 1, 700 pages and decided that it would be best to split the series in to three parts. Over the course of his research Marc would discover that the drama behind creating Star Trek was almost as incredible as what we were watching on screen. Using the show files he would discover that at least 30% of the information that we knew about TOS on the internet was in fact false; including the myth that Star Trek did not perform well in the ratings, in fact during the first season Star Trek was the top rated show on the networks.